Our Aquapro UV12-L Replacement UVC Light Bulb is a 4 pin on a single end light bulb that has a total length of 33.19" and an arc length of 30.12". The replacement UVC light bulb kills and sterilizes bacteria, yeast, virus and pathogens in water. It is compatible to the OEM water disinfection filters, sterilizers and UV purifiers. The light bulb emits a peak UV output of 253.7nm. The four pin, single ended, 44 Watt bulb must be replaced annually for better performance. The replacement light bulb is eco-friendly and cost effective. The short wavelength emitted by the light bulb alters the DNA of the microorganisms to render them harmless. *All germicidal UVC light bulbs listed are compatible brand UV products. We do not sell AQUAPRO brand UVC bulbs. All AQUAPRO brand names, trademarks, and logos are property of AQUAPRO. *Warning: Ultraviolet UV-C light is harmful to your eyes and skin. Use proper safety gear. 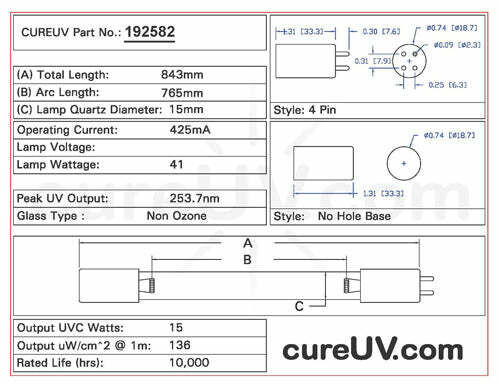 Note: CureUV.com stocks generic products that are 100% compatible with the original equipment.